What plagues the youth of our great nationis this- “More than 60% of the eight lakh engineers graduating from technical institutions across the country every year remain unemployed”- These figures have not been raked up by anyone other than the All India Council for Technical Education (AICTE) itself. What plagues the youth of our great nationis this- “More than 60% of the eight lakh engineers graduating from technical institutions across the country every year remain unemployed”- These figures have not been raked up by anyone other than the All India Council for Technical Education (AICTE) itself.This, thus, translates to a total potential loss of 20 lakh man days annually. That's not all. Less than 1% of engineering students participate in summer internships and just 15% of engineering programmes offered by over 3,200 institutions are accredited by the National Board of Accreditation (NBA)- all these have been directly attributed to the fact that the skills imparted to students at the Graduation or Post Graduation level is not aligned to Industry standards, making their degrees moot and unnecessary. So now what? The obvious question that comes to a person’s mind when they contemplate this issue is how to differentiate between the right and wrong CHOICES in selection of not only the Program of study, but also the Institution. For instance, mere association of the Institution or University of choice with professional bodies like ASSOCHAM, CII, FICCI etc., no doubt enable a student or graduate to stay connected with the industry but this alone is not sufficient! So, what is the right direction- CHOOSING A REPUTABLE UNIVERSITY with the RIGHT INDUSTRY LINKAGES. So, the next question which arises is- What is the RIGHT Choice? A brief search on Google will tell us about what gives Graphic Era University the edge-it is its association with Industry Giants such as TATA Technologies and Salesforce. TATA Technologies as a company needs no further introduction; being a part of the Tata Group that provides services in engineering and design, product lifecycle management, manufacturing, product development, and IT service management. 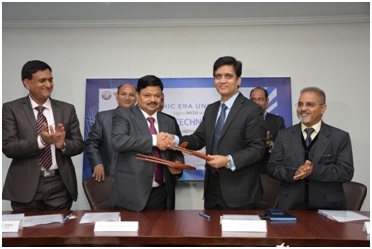 As a part of its unique initiative to foster innovative progress, Graphic Era University together with TATA Technologies, has formulated Centre of Excellence Partner Labs in the field of Robotics and Automation, Mechanical Engineering and Electronics and Communication Engineering in cutting edge innovative disciplines such as Internet of Things. Its recent association with Salesforce, global leaders in the Cloud Computing Market, with their Cloud Based CRM Offering currently holding more than 20% of the global market share, saw Salesforce Officials conducting a one of its kind 2 Day workshop for graduates of Graphic Era University that will now enable students to develop potent applications on the SALESFORCE platform, and exponentially improve their employment prospects across the globewith over 1200+ engineering students of Graphic Era Group participating in the same. Graphic Era University additionally has established itself in education not only in the national education scenario but also in various International platforms with its association with various International Universities if repute all across the globe be it USA, UK, Europe or the Middle East- there is no corner of the globe where the presence of Graphic Era University cannot be currently felt. 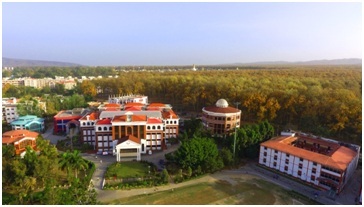 In fact, Graphic Era University, in addition to being NAAC Accredited Grade A with the Highest Graded Score of 3.23 and NIRF Top 150 Rank Bands, has also been awarded the Best Regional University Award by the Europe Business Assembly and the Leading Private University award by the BERG in Belgium. So, a degree from any University such as Graphic Era definitely ensures an Employable Graduate and helps one achieve both professional and personal growth by being connected with the entire Alma Mater of that institution.